What would happen if Uncle Sam applied for a loan at his local bank?” What sort of deal could he expect to get on a 30-year, fixed-rate mortgage? You may have noticed Newfoundland recently abolished interest on student loans; I know a fourth year who just diverted a scholarship from loan repayment towards entertainment purposes on the basis of the decision. I'm trying to formulate an idea on the equity premium puzzle (or lack thereof, now that long-term bonds performed as well as equities over the last fifty years, though that won't stick, I hope) and the option value of being able to leave the market at any time, but I can't piece the strings together and don't have the time to poke through the literature. I'll write that down for summer. The flyout went well. Nine people showed up, one more than last year, giving the students a chance to consume wings and beer on the department's dime. What else can one ask for? Here are the budget highlights, here are the actual estimates. EDIT: And here is the budget thrown into wordle. Firstly, I highly recommend that you (at least the Newfoundlanders) take the time to poke through the estimates, at least the first 18 pages. They're almost distressingly readable. I don't expect this level of clarity in any financial document, let alone a provincial budget. 2009-10 total revenues: $5,348,371,000 (estimated). I have no solid knowledge of the ins and outs of the equalization agreements with Ottawa, one practically needs a degree in the subject. But it's a big budgetary hole to fill, which is where the $750m deficit steps in. Of that 5.35 billion or so, 1.26 billion stems from offshore royalties; the budget estimate is $50/bbl. We paid $146,508,000 into equalization, or approximately $300 per Newfoundlander (but still win in terms of provincial side deals, with triple that coming back from the 1985 Accord). It will cost $24 million to run the legislature this year - up 20% from last year's $20 million. Should I expect news stories about this? Education spending is also up 20% from last year. Government is spending a quarter-billion on something called "resource development". Any ideas what that is? Servicing the debt still costs a half-billion a year, but this has got to be a monumental improvement relative to a few years ago when we had $4billion more in debt and interest rates were considerably higher. It should be made clear that we're having a party on the back of the oil money. I hope that it doesn't end, but that's unrealistic. It's an excellent party, and we're even being fairly responsible about it by taking some good chunks out of the debt. But the level of spending growth is way, way unsustainable and barring a ton economic development somewhere outside the oil patch, it will eventually come home to roost in the budget. That could easily be twenty years down the road, which is a long time, but I feel like it would be pretty inexcusable to leave the oil patch behind with a provincial debt still on the books. After a disappointing eight weeks wrangling with business cycle models that were predominately conceptualized before I was born (King/Plosser/Rebelo, Hansen/Rogerson indivisible labour, etc), the final stretch of macro is looking pretty good. Subdivides into labour market frictions, financial frictions, and growth. The latter uses Acemoglu's new textbook, the former two are based on much more modern papers than the business cycles bit. So far we've gone through Mortensen/Pissarides in considerable detail. I enjoy it. Also, the prospective first-years will be visiting campus tomorrow. I'm looking forward to it. Free food on the department dime, reminder that it will be summer soon, etc. I promise a post with some content soon~! With the seal hunt kicking off this week, I felt like I'd drop in a few facts. The DFO tallies the value of seal landings. About $8million in 2008, $31million in 2006. It is unclear how this number is calculated. Is this the commercial price? Retail price? Does it include value-added for processed pelts or flipper pie? I suspect that "landed value" means no. There are claims that it costs the government of Canada a lot of money to oversee the hunt, maintain medical services for sealers, etc. There appear to be no credible references here. A common number thrown around by animal rights groups is that the hunt costs about $20million of government money to run. The DFO maintains it does not subsidize the hunt. There has certainly been no direct subsidy since 2001. There is certainly some government cost associated with the hunt. Both the DFO as linked and Greenpeace concede that there are no reliable methods of linking changes in seal population to changes in cod stocks. I will endeavour not to get mixed up in any of the non-economic issues, though it is clear that a large part of the world either derives disutility from the seal hunt, derives utility from decrying the seal hunt, or some convex combination thereof. If it the former, there is a possibility for a Coasian bargain, i.e. the rest of the world pays off Atlantic Canada to stop the hunt/transport the seals somewhere else. If the latter dominates, then it is optimal for the hunt to continue. You may take the fact that no such bargain has ever approached the table as you will. It's mildly depressing that the entire economy of Canada ($1.3 trillion) fits inside the US budget deficit ($1.7 trillion USD). It's not even close, there's hundreds of billions left over to chew up half of Africa or Sweden or something. Makes it really hard to argue for coordinated international fiscal stimulus - if Canada went for a stimulus plan far more ambitious than pretty much anyone is calling for, it would barely constitute a rounding error in the US deficit. Since at least 1307, when King Edward I banned the burning of coal to protect his citizens’ “bodily health,” governments have regulated the release of pollution into the air. Here's the paper. Upon reading this, I immediately thought that the Romans. must've had something to this effect, but I can't turn up anything on google, and pieces like this suggest there simply may not have been. Also joined the local NCAA pools that have circulating in the econoblogosphere. I was 97.4 percentile last year, despite having never watched a televised basketball game, mainly by overwhelmingly playing the higher seeds. I will also be representing the graduate students in basketball as the annual spring sports contests kick off here in Rochester. Profs versus students, basketball, volleyball, soccer, softball, american football. The betting odds are on the professors. EDIT: We've finally managed to bump wikipedia from the first google result on 'stackelberg follower'! Thanks everyone. Since the Fed announced it was going to buy a gazillion dollars of bonds, the US dollar is down about 5% against the yen. I assume these events are not uncorrelated, and that Sony et al aren't huge fans of the currency swing. We've heard pretty much all parties and pundits say that a duel of devaluations should be avoided. What exactly is the precise definition of devaluation, and does this Fed program meet it? It certainly devalued the dollar somewhat, even if that was not the primary or stated goal. Would we get the same currency effects in a country that doesn't function as a safety perch? If not, does that mean these sort of bond buybacks are "fair", since most people can do them without breaking the devaluation code? Are monetary authorities "allowed" to devalue only as a consequence of doing other things to fight the recession? Is this solely a function of the fact that the distribution of genders across industries is not uniform? Probably, but I'd at least want to look at the data from past recessions to see if a pattern holds. For those of you not resident to Canada, each province in Canada regulates the sale of alcohol differently. In New Brunswick, for example, there is a minimum price of $18.67 per 12 cans. However, many parts of New Brunswick are not a long drive from parts of Quebec, where beer can be found for as little as $12.50 per 12 cans. This has led many thirsty New Brunswickers to drive a little bit more to secure suds at cheaper prices. Now, the government of New Brunswick doesn't like this one bit, because the only place you can buy beer in the province is at NB liquor stores - stores which managed to lose $12 million last year. Yes, they have a monopoly on alcohol sales, and they still managed to lose money. That takes serious talent. So, the solution to stop New Brunswickians from giving their money to Quebec convenience stores and government? The government starts to make its own line of beers to sell at the price floor. Duh. Note that competing beers have to apply to government to sell at the minimum price, and can only do so for a limited period of time. So not only is the government spending the taxpayer dime to make beer (which the government contracts out to Moosehead), but it is forcing other beer makers out of business in the process. How does one possibly defend this policy? Why did ANBL choose to create and market its own beer instead of dropping the price of currently available beers? ANBL has launched Selection Lager and Selection Light to provide New Brunswick consumers with an everyday low-price alternative in the domestic beer category. Our plans include the introduction of cooking and drinking recipes, because suggested use is the best way to grow volume. This way, we can effectively counteract the decline in the domestic beer market in New Brunswick. Simply lowering the price of existing brands would only result in a share battle. POSTSCRIPT: Note that the government of Newfoundland manufactures Iceberg and Screech products through the Newfoundland and Labrador Liquor Corporation as well! I believe it is unique among Canadian provinces in this regard? I assume anyone reading this blog is heavily exposed to the rest of the econoblogosphere, and are thus aware that a lot of really big names have issued serious complaints about the state of modern macroeconomics, which is often described as Chicago, or Minnesota style. If one was to complete the trinity, Rochester would probably be the apt choice. One and a half semesters towards becoming a macroeconomist myself, basically all I've been exposed to is rational, optimizing agents, an economy driven by real shocks - government spending and productivity - so on and so forth. It wasn't until a couple of weeks ago that 'money' appeared. Basically, what I'm saying is that you could get through a year of macro at Rochester - and then do metrics or micro - hence completing a PhD in economics without every seeing 'money' mentioned, with only a small change in the present curriculum. It appears Dani Rodrik thinks this would be a problem. The bad news is the world could really use some practical, relevant macroeconomic theory at the moment. Brad DeLong and Paul Krugman are doing a superb job of reminding us of the continued relevance of Keynesian thinking. But they are hampered by the absence of micro-founded models that plausibly deliver the Keynesian remedies they advocate. I am, however, fairly confident with the theory of supply and demand. Also with the desire of many tenure track economists to receive the accolades of Krugman and others. So, there appears to be a large demand for these micro-founded models (based on the actions of aggregated rational individuals), but very little in terms of supply, consistent with the belief that a large reward awaits those who can produce. And yet, we don't see these models being produced. I am under the impression that this is because when you try to craft these models, they just don't match the data at all, to paraphrase one of the professors here from the other day. Note that in real business cycle models you can construct government spending multipliers greater than one, but the ones I've seen have this effect result from the government spending making people feel poorer and having them 'purchase' less leisure as a result. And I don't think that's how Keynesians percieve their stimulus. Now, perhaps there is some insight out there that can rescue Keynesian models and make them approximate the data to a reasonable degree, or perhaps reconciliation simply isn't possible without seriously changing the definition of Keynesianism. Given the effort that's been exerted, let's assume for the purpose of argument that it's the latter. Can we still advocate Keynesian positions and call ourselves social scientists? Don't think so, but I can't see people giving up, either. POSTSCRIPT: For the record, I continue to believe that the real side of the crisis is roughly approximated by a destruction of a large chunk of the capital shock. I can't really say anything about the monetary matters. I also had an interview for a summer RA position the other day, which I failed to secure. Which is probably deserved, since the girl that did get it was running 95%+ in macro I, while nobody else in the class was threatening to break 80%. Still, being approached by a prof for the position makes one feel good. GM's market cap today is about $1.1bn USD. How can you justify giving tens of billions to a company that the private sector values at a fraction of that? How about the next time they ask for a bailout, take a fraction of the money, buy the whole thing, extract whatever money can be taken out for pension/health liabilities, guarantee the rest, and just give whatever is left to Ford, who can take whatever choice bits they might care to have? I have no idea how large GMs unfunded health/retirement obligations are, so that would be a factor to consider first, though. POSTSCRIPT: Had a downright mediocre, if not poor midterm this morning, though yesterday's went well. I simply got outworked. It's remarkable how much everyone here really devours this stuff. One guy has slept in the department computer lab for the last week, he hasn't been home once. I know there are more makeshift beds in various offices. I don't think I'm ever willing to go there. Written by some guy at the CBC. Okay, I feel compelled to point out the facts. 1. Unemployment has been rising for all of 12 months. 2. GDP has been falling for about six months. Neither of these constitute anything close to 'forever'. Even at my age I know this. Similarly, there's nothing to the claim that capitalism is broken. I'm not sure what it means to break a concept. And even if it's not perfect - and made less so with things like government mucking with deductible mortgage interest - it still remains the only vehicle in town whose engine can turn over. Capitalism itself is not broken at all. It breaks down as a result of the unintended consequences that get unleashed when governments interfere. That comment has received 14 negative votes and zero positive ones. Well, maybe there's a touch of deflation there. 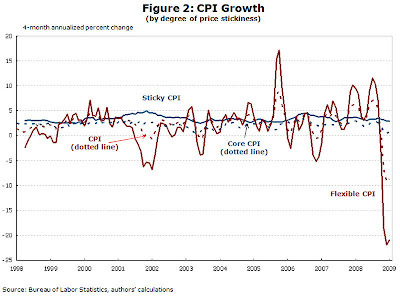 Chart is taken from macroblog, who construct a sticky price goods CPI and a flexible price goods CPI, as plotted. The data on stickiness are taken from the Bils/Klenow study (Bils being Rochester's top-ranked professor). Stickiness is a difficult thing to measure, though, and I can't comment on the exact methodology because I have exams tomorrow and the day after. However, consider the case of glossy magazines, the cover price of which changes very infrequently. We might be tempted to conclude they are a sticky-price good. But that doesn't reflect how often the prices of advertisements (the main source of revenue) in the magazine change - much more frequently than the cover price does, so looking at the CPI data will overstate the stickiness. It's also interesting to note how the author of the macroblog post prefaces with a mention that stickiness is considered close to the heart of the matter of business cycles, and absent it, things would go much more smoothly - but there are lots and lots of famous economists out there now saying that we can't let prices adjust. We had a brief introduction to sticky price models today in macro as well. What timing. POSTSCIPT: Today, Krugman has a post entitled "All your downside are belong to us". For those of you not in the know, this is a a play on a terrible translation of a twenty year old Japanese video game which became a popular catchphrase on the internet many years ago. I can't help but wonder how such memetics come to the attention of Nobel Prize winners. Or is this phrase really so popular? Rather, the scandal is that AIG could have earned billions of dollars by selling insurance against a meltdown, even as it was wholly incapable of paying out on those policies. I wouldn't be surprised to learn that Hank Greenberg was still a billionaire, even as the policies his company wrote have cost the average American household some $1,600. It's time for his wealth to be confiscated: it might be only a drop in the bucket compared to AIG's total losses, but it would feel very right. Article, hat tip from Free Exchange. Put aside whether Greenberg is still a billionaire or not. Suppose he still is for the purposes of this post. The idea that we can arbitrarily take money from a private individual because they erred - deliberately or not - because it 'feels right' is incredibly wrongheaded. You can find people who would feel good about pretty much anything. However, being a relatively civilized people, we have pesky things called laws, due process, blah blah blah. If Greenberg or any of his colleagues broke the law, then fine, lock down the accounts and prepare the cells. But if they didn't, all we can do is create better laws and regulations for next time. What's even more worrisome is that promoting the idea that Greenberg should be arbitrarily penalized, irrespective of law, assumes the existence of an individual, committee, whatever who is capable of deciding who gets punished and to what extent. This is way beyond slippery slope territory. Yes, there is certainly a base desire for revenge in most all of us. It doesn't mean we should reenact Lord of the Flies. POSTSCRIPT: Shouldn't some blame be assessed to people who bought all this insurance from AIG? Were they oblivious? Or were they just counting on if stuff blew up that a bailout was a sure thing? Are these 'sins' 'better' or 'worse' than selling the insurance?